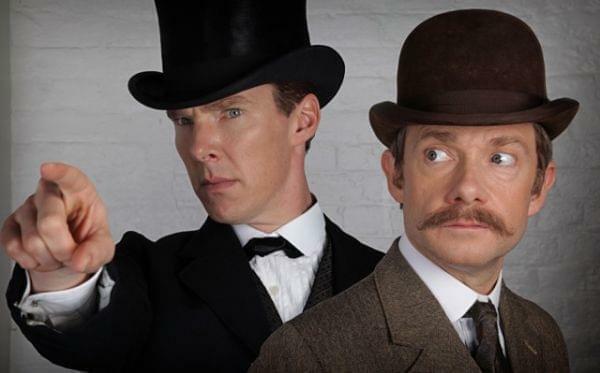 The recent "Sherlock" special reflects current trends in the worldwide media market. Sherlock (Benedict Cumberbatch) and Watson (Martin Freeman) in "The Abominable Bride." The most recent Sherlock special, The Abominable Bride, followed the Midwife's lead and aired on New Year's Day in both the UK and the US. I think that this is an example of the immediacy demanded by denizens of the Internet Age. We want in on the conversations that occur soon after a broadcast of a popular show, even if that show is not yet available in our country. I suspect that the pressure for worldwide, same-day release of mass media content will increase. The Abominable Bride was unusual in another respect, in that unlike virtually every other program acquired by PBS, American public television stations were restricted to a single telecast for the first release. No repeats were allowed. If you couldn't find it in our overnight schedule this week, that's why. Due to this exclusive engagement, PBS stations were forbidden to repeat the program until this coming Sunday, January 10. It will air at 9:00 pm on WILL-TV, and yes, there will be overnight repeats if you miss it.